Beautiful Satin Doll captivates vacation makers with its old-world charm. 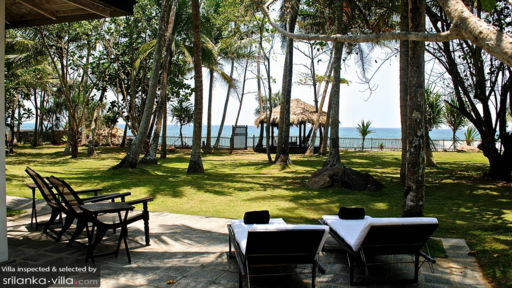 Guests residing here will find a lovely abode set in an expansive garden situated right by the beach. 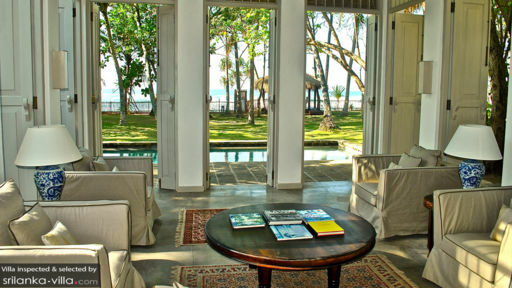 Nestled away in a quiet spot in Galle, the villa promises to offer a serene retreat for travellers seeking a restful getaway in the tropics. Five well-appointed bedrooms serve as peaceful sanctuaries ideal for a night of uninterrupted slumber. The rooms are separated into pairs in two different wings, providing an arrangement perfect for accommodating two families. Couples will enjoy a cosy evening out on the private terrace extending out from each of the bedrooms, for it offers striking views of the emerald garden and boundless ocean. Stroll through the sprawling gardens of Satin Doll, and you will find plenty of shady coconut palms, a sparkling pool, and a handful of cosy outdoor spaces built for rest and relaxation. Two beachfront pavilions serve as excellent spots for watching the magical scenes of sunrise and sunset. A wooden fence lines the garden, its gate swinging out to create an entrance for guests to step out onto the sandy shores of the beach. 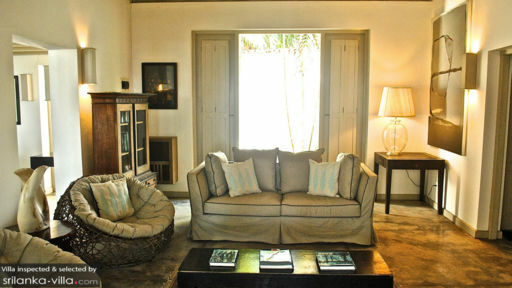 Guests will find the well-furnished interiors of Satin Doll a welcoming and pleasing sight. An array of cosy armchairs and couches offer plenty of comfortable seats, while tasteful home ornaments, such as colourful carpets, pretty lamps and quirky art pieces lend an elegant touch to the interiors. A variety of amenities ensures that there is something for everyone - film buffs will enjoy rounds of their favourite films in the TV room, while bookworms will not be able to resist curling up in a quiet corner with a book in hand. Travellers keen on venturing out will find a variety of charming boutique shops and restaurants in the nearby historical town of Galle. Be sure to take an exploratory stroll along the Fort walls. Do not miss the magical hour of sunset, for it promises to provide a breathtaking sight. Cultural buffs will delight in exploring attractions such as the Dutch Reformed Church and Martin Wickramasinghe Folk Museum Complex. Place is amazing, food is great, and delicious. This house has a very special style and is beautiful; congratulations for realizing such a nice place and shone it with guests. This is intimate, calm, and the staff helped for all on little request. Hoping to come back soon! Thanks. Expectation were surpassed from the moment we walk in. Food was sensational and the friendly staffs were always there when needed. It is hard leaving and returning to work. I am sure all fun of us will return before too long. This house is heaven. The rooms and communal areas are beautiful decorated, extremely relaxing and comfortable. The staff are superb, well trained, keen to please but at the same time respectful of privacy. Which all goes together to make it a perfect spot to unwind and slip in to the pace of this tropical delight. I would definitely return.